This fab give-away was won by Elena Gardin! Congratulations Elena! Thank you to everyone who entered. To celebrate My Scandinavian Home's first birthday I've partnered with the fab shop Scandinavian Design Center to offer you the chance to win this very cool Pappelina black and white striped rug (70 x 200). The give-away sponsor, Scandinavian Design Center, is a bit of a fab one stop shop for Scandinavian design, furniture and home decor where you can buy design furniture, get decorating ideas and read about designers and Scandinavian interior design (yes please!). This give-away is open to everyone! Be sure to enter latest Monday 22nd October and don't forget to include your e-mail address so I contact you. The winner will be announced here, Twitter and Facebook on Tuesday 23rd October. Good luck! This give-away is now closed! Thank you to all who entered. The Taika cappuccino mugs in red are lovely! Pretty and practical! Wow, love this giveaway just because it has introduced me to an amazing new store! I love almost everything but as I am currently in the market for some new storage, I really like the Bill hanger. I'm also a fan of the arrow hanger as well, both might be coming home to me soon. So many nice items there, really hard to choose one favorite, but it seems that the Blossom teapot caught my eye because its cheerful and colorful design! Any of the Marimekko fabric will do! Great to find a source with so many of their designs. Thank you! Oh I love Pappelina rugs! And Scandinavian Design Centre! My favourite item on Scandinavian Design Centre's website has to be the new Aki rug by Pappelina in light orange....just perfect. The Kartio carafe would be a lovely addition to any table setting. Such lovely things -it's tough to choose! I really love the 'In the neighbourhood newspaper stand' , perfect for storing all my interior magazines! I love scandinavian stuff so this one is really my style! My favourite item is the Fia carafe in black/clear. Simple and functional but stunning, beautiful. A true art object. I LOVE THIS GIVE AWAY!! Hi! I love the Flowerpot table lamp (in white)! And of course I would love to win the rug! 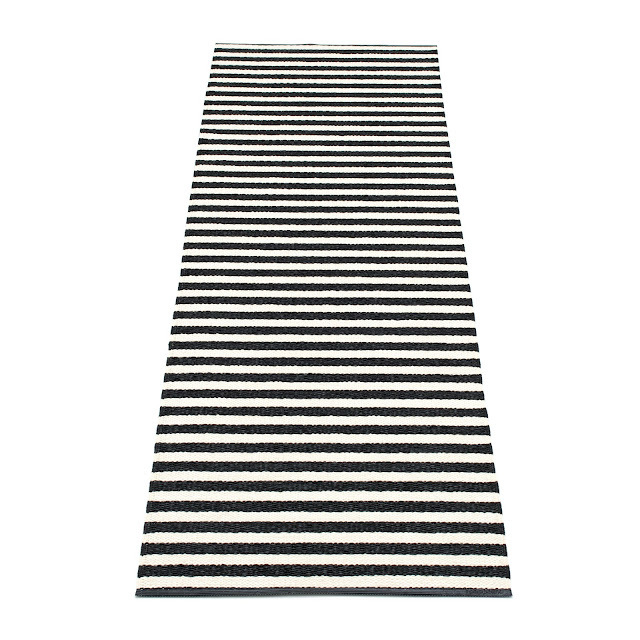 I love the black and white Pappelina rug! A great giveaway! My favourite product at this moment is the String shelf. the design is beautiful. Great for both storage and display. What a great givewaway! As I love stripes I also love the rug...The Scandinavian Design Centre shop has so many great things to offer but if I have to choose one favorite item it would be the Muuto Studio Lamp and the rug of course. Here is to many more blogoversaries! One of my favorites on the scandinavian design center site are the Spire tin boxes from Ferm Living. Love the black&white and the traingle design. Happy 1st year blog birthday. I would love to win the rug as Im currently doing my hall up. My total favourite on the Scandinavian Design Centre site is the Kay Bojesen wooden monkey. I would love to have him hanging round the house! My fingers are X re the rug. And happy birthday myscandinavianhome! Thanks for sharing your ideas all along the year... It's much appreciated, especially when you're moving to a new place, like I just did. Happy birthday! Thanks for the giveaway. I'll cross fingers for the rug. At the Scandinavian Design Centre, I am now into the String shelf Pocket, which always reminds me something scadinavian. The Moo wall lamp. Funky, fun and a refreshing take on the deer head & antlers! Sweetheart bowl - Perfect for Christmas and all year round and to remind me of my Christmas wedding this year. I'm enjoying all of the Christmas items, especially the Nordic Light Candleholder. Thanks for offering the rug. Happy Birthday! I found the cable organiser nice. I would by for sure something from Ferm Living! Anyway there are tons or wonderful things in this shop! wow this giveaway is hot property! That is a great site they have so much to choose from i will make a book mark!! I love the Kiwi candleholder, it's sleek and beautiful! So hard to choose a favourite but I love the Taika range, expecially the large bowl. Honestly it is quite difficult to pick ONE FAVORITE thing in the Scandinavian Design Center. I would furnish my home with SO many of the items - and probably will... we are building a new home and I have been using some of the items in my inspiration designs for our new house. However, because I must choose one - I choose the Altavoz shelf pink. I LOVE the optical illusion of the interior paired with the simplistic objects on the inside. I am a ceramic artist and I would choose a similar way to display it but with hand made objects by me and my friends. Thank you for offering the giveaway - the Pappelina Black and White rug would fit right in to our decor and I would love it!! I look forward to the contest end. Happy Birthday and thanks for the Scandinavian beauty on this website and yours. Ferm Living's Columbine cushion, for it's fabulous colour and design makes my heart sing!! I absolutely adore the Marionette bedding set. And this Pappelina rug of course. too hard to chose just one ... I ADORE the amelie & alma wallpaper. great give away. thanks for the chance to win. Well I just spent way to much time looking through that site! I love the colorful blankets and throws. The Anna Throw -- so cute and cozy! Love the Vilda Wool Throw too. I love this shop-- thanks for the link! And apparently they ship to Canada as well. Their rugs are great and I love the one you're giving away, but I really love their large Karin rug in black. It would be perfect for our new house. Oooh how exciting! I actually saw some of these goodies when I was in Stockholm last week so I am doubly excited! I have so many favourites but I am totally in love with the Cambridge lamp! Loving the the stuff Nikki - however for my gun boots the Boot Jack would be very useful. Please, please, please let be me! ;) It's just the perfect combination: your blog + Scandinavian Design Centre! My favourite item is the Foto Floor lamp but I think it'll stay in my wishlist for some time more. I love the Ferm living Remix Blanket - oh so much! It's soft and cozy but with an cool and edgy pattern, in nice colors, just the way good design should be. There is so many things to love in that store, but as a foody i really love kitchen supplies. I work in a store where we are specialised in good tools and design. So i have crush on every Eva Solo, Stelton and Sagaform products! BUT my heart goes with Iittala!! When i feel bad, the only way to get me back on track is to look at the Iittala catalog. LOL Yeah i know it sounds weird. Love the Marimekko stuff! It's so simple yet bold. I really like most of their pillows! Collect cabinet is stunning and fun, but whole range of Pappelina rugs is fantastic. Great giveaway Niki, and I love the Toronto Flat post. Rusken pendant light from Watt & Veke, fantastic value for a timeless design! Don't have to be super rich to be super stylish! I like the polar bear wool rug! Polar bears are my power animal, and I love anything with them on there... plus, it's getting to be winter time and it'll add a little zazz to my holiday decor. I have simple tastes - it's a Moomin mug for me! It's hard to find anything from Scandinavian Design Center that I do not like but I'm especially loving the wire baskets and the shelves. I'm remodeling the office right now so I'm very office focused and these two items would look great in the new space. Too many choices, so many nice things! As I´ve been a fan of Moomins for years, I have to say a moomin mug to add to my collection would be perfect. Thank you for your nice blog. I like the Moomin WInter Forest mugs! I often check out Scandinavian Design Center. Actually I like everything!! My favourite item is String shelf Pocket in white because of its minimalistic timeless design that makes it so modern and so easy to fit everywhere. Thank you for the giveaway and happy anniversary! My favourite is the Molly rug blue. It would look perfect in my son's room. There are so many fantastic things to find in this store! I collect the Marimekko bowls for example and the Iittala Essence glassware. Of course the Pappelina rugs are great and it would fit perfectly in my living room. And then there's Ferm Living, I love pretty much all of their products! I love Gladys chandelier for it's beautiful lace shape. I like its snowy christmassy pattern, which can give a fantastic light and shadow interplay effect on walls and ceiling. Thanks for the contest! Love your blog. Readers Nest book shelf !I love this little bedside table. I saw lots of other cool products but really liked this! I like Edvin wallpaper, blue.It would be perfect in my walk in closet! I looove the bjork stool low! Plain duvet cover white. It may look plain but it's everything but. There is nothing better than a good nights sleep between high quality sheets. Good for both body and mind! Love your blog! Loving all of the throws, specifically eyeing the Vinga throw in white, and the Forrest children's blankets. It's hard to choose just one! So clad I stopped by here! I think I fell in love to Boudoir wallpaper, because I just love kitch things and Frame Easy chair, because of it´s timeless ansd stylish design and Björk carpet darkgrey because it would be very practical in our kitchen. There was so many nice things. String pocket is my favorite I think. Great giveaway! I lurve the Pappelina rugs!! I ADORE In the neighbourhood newspaper stand ! Thank you for the chance. I`m all about staying indoors, light some candels and watch a movie right now so then the beautiful Bjrök wool throw would be perfect in the sofa with me. I do love the Elflugan lights - nice for every evening. I would create inside the house window boxes and include this. Thank for the giveaway. I like the block lamp . have a great weekend. Merci beaucoup. i love all the ferm living wear! i couldn't choose there is just so much. the wool throws, the boudoir wallpaper . . .
Wow! While I got lost in the Christmas decorations and Truly Swedish section, I have to say I adore the Karin rugs. Beautiful products! I look forward to perusing there often. Thanks for such a great giveaway; that rug is gorgeous! Loving the String shelf Pocket, classic yet thoroughly modernized with the pop color variations. My favorite is black Cinema sofa. Simple, elegant, sophisticated, timeless design. Happy Blog Birthday. What a wonderful website is has some really, really great things. So hard to choose, but loved the very pretty Night Fly mini pendant. It brings the summer into the bedroom even on the coldest of nights. Niki your blog continues to inspire me! Thank you for introducing me to the scandanavian design center, it cost me a good few hours today! I love the Kastehelmi cake plate, stylish and a great incentive to bake something for once, miracles do happen! I really like the lamp PXL, it's so bright and fun! Wow, that was a difficult choice, but I'll say the HEIMA candleholder. I like this fabric because it looks cheerful and I like the blooming flowers . I can picture me and my nephew-to-be (who is to be born any day now-maybe even tonight) snuggled up nice and cozy under the Jungle wool blanket reading "Where the Wild Things Are" on a cool Fall night. I just moved from The Bahamas to Germany. This is going to be the first winter of my life, so I think my favorite product is the Saltkrakan throw.... A beautiful throw to snuggle in during my first German winter! my favourite item is the Siirtolapuutarha bowl, large size. Ohhh it is an easy one for me. Scandinavian Design Center had my darling the String shelf soft in pink and valnut. That is the product I would die for. What a great giveaway, but hard to choose. I narrowed it down to 3 categories: the Pappelina rugs of course; Klippan Yllefabrik throws; Boel & Jan oilcloths. Almost impossible to choose my favourite in each category but since I had to: Pappelina - Bob in mud/vanilla; Klippan Yllefabrik, Bukket olicloth Ruta (who can resist red gingham? ); Boel & Jan Ingeborg dark grey throw (love greys teamed with colours. Even more impossible to choose just one, but I think the oilcloth wins, I love gingham tablecloths but need one that lasts and that allows me to clean up spills. We choose designer's furniture for our house because this is one of the center of attraction on our house. But there is one things that are also important and this is the rugs. We need to choose the rugs that can compliment with our furnitures and other things inside our house. Plant Retro Table is my choice. Incredible retro-futuristic furniture with authentic Scandinavian design. Simplicity and versatility. Check out! Gillar de nya delarna FLORIS av Ostindia servisen. Har många delar av servisen förut, så det skulle vara spännande att komplettera med några av dessa nya delar. Happy 1st birthday! I love the elflugan electric candle to brighten up the dark days! Thanks for a great give away. I'm new to your blog and look forward to following your style tips! My email is melissa@hqk.se. I'm currently loving all of the Ebba and Luna stars, the Anna throw, and the Flowerpot (big size). I am loving the details and tiny flourishes of color for each! it's still oct 22! woohoo!